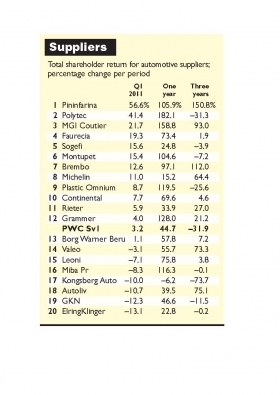 The momentum of recovery faltered again in the first quarter of 2011 for all three automotive stock groups followed by the Automotive News Europe/PricewaterhouseCoopers Transaction Services Shareholder Value Index. Following three consecutive quarters of strong growth, including an 18 percent rise in Q3 and Q4 of last year, automakers fell by 1.7 percent in the first quarter of 2011. Retailers, already back to zero growth in Q4 last year, had their shareholder value decline 3.4 percent in the first three months this year. Partsmakers returned positive growth in Q1, but the 3.2 percent increased in shareholder value was well below the 11 percent achieved in Q4 last year and the 23 percent seen in Q3. The performances of the three auto groups were much in line with relatively lackluster results from leading share indices over the same period. The Dow Jones Industrial was up just 0.5 percent in Q1, the German DAX 30 up 1.8 and the UK's FTSE 100 down 1.9 percent. "The auto industry is facing up to a further period of uncertainty as consumer spending falters, with the knock-on effect of the Japanese earthquake also impacting sentiment in the first quarter of 2011," said Jason Wakelam, leader of PwC UK's Automotive Transaction Services. 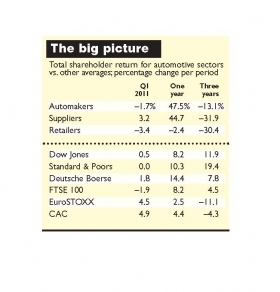 Automakers suffered the biggest setback of the three automotive stock groups tracked by the Automotive News Europe/PricewaterhouseCoopers Transaction Services Shareholder Value Index. Volkswagen AG was the only one to achieve a positive result in Q1, although this was a modest 2.3 percent increase against 31 percent in the preceding quarter. This was in a quarter which saw the German-based company report record growth of almost 2 million deliveries, up 14 percent on the same period a year earlier. VW's biggest gains came in developing regions such as China, India and Russia. 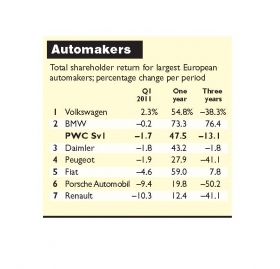 Renault had the biggest decline in Q1, down 10.3 percent. The company made headlines for a botched espionage investigation that led to a number of executives being fired or reassigned. Furthermore, reflecting current difficulties, in February analysts at London investment house Morgan Stanley downgraded its position on the Renault, saying it preferred exposure to French rival PSA. The biggest turnaround in fortunes, however, was experienced by Porsche. Currently pushing ahead with a much-needed 5 billion euro rights issue to wipe away some of its debts, the German sports car maker followed its table-topping 65 percent growth in Q4 with a fall of 10.3 percent in Q1. "It is clear that government austerity measures throughout Europe are taking their toll on consumer spending, which was always the underlying concern," said Jason Wakelam, leader of PwC UK's Automotive Transaction Services. "Compared with two years ago, the luxury marques may buck the overall trend, aided by demand in Asia." The overall trend in the in the Automotive News Europe/Pricewaterhouse-Coopers Transaction Services Shareholder Value Index list of 20 European partsmakers was significantly downwards. Within this, however, there were mixed fortunes in what was effectively a game of snakes and ladders. The number of companies recording negative growth doubled from three to six between Q1 this year and the preceding quarter. "Parts suppliers typically feel the effect of difficulties faced by the vehicle manufacturers and the last quarter has been no different," said Jason Wakelam, leader of PwC UK's Automotive Transaction Services. The top two performers were design and engineering specialist Pininfarina S.p.A., up 56.6 percent, and optical instrument maker Polytec Group, up 41.4 percent. Both firms languished at the bottom of the table in Q4 last year and jumped 17 and 18 places respectively. The surge for Pininfarina reflects ongoing speculation around the planned sale of the Italian company and its termination of contract manufacturing. Reflecting the volatility throughout the supplier shareholder value table, the top eight places were all filled by companies climbing a significant number of spots. Italian filtration and suspension systems specialist Sogefi, for example, rose 10 places to fifth and the world's second-largest tire manufacturer, Michelin, recovered 11 places to go into eighth. This trend was mirrored in the bottom half of the table, where all 10 places were filled by companies losing position. Among the weakest performers were ignition specialist Borg Warner Beru, whose negligible 1.1 percent growth in shareholder return saw it slip 12 places from the top slot in Q4 last year. Other big declines came from general engineering and drivetrain company GKN plc, down 16 places to 19th and safety systems maker Autoliv Inc., dropping 10 places to 18th. 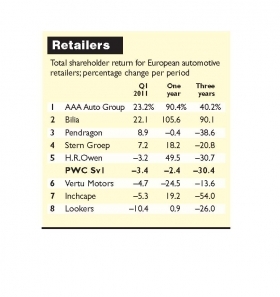 Five of the eight retailers in the Automotive News Europe/PricewaterhouseCoopers Transaction Services Shareholder Value Index recorded declines in the first quarter of this year. This compares to just one in the preceding quarter. AAA Auto Group NV again took first place, its 23.2 percent growth in Q1 this year building on last year's Q4 growth of 22.6 percent. The company operates new and used vehicle sales subsidiaries in nine central and eastern European countries. Swedish dealer group Bilia AB once again demonstrated good growth, improving on its good performance at the end of last year with 22.1 percent growth in Q1 which lifted it from third to second place in the table. However, the biggest winner in the quarter was Pendragon Plc, which operates 300 franchises across the UK. The only retailer to have failed to achieve growth in Q4 last year, a tripling in after-tax profits for 2010 was rewarded with an 8.9 percent growth in shareholder value, lifting it from the bottom of the table to third place. At the luxury end of the UK market, however, HR Owen Plc failed to sustain the much improved 21.6 percent growth which had secured it second place in the final quarter of last year. A 3.2 percent fall in shareholder value saw it fall back three places to fifth. "The new-car market continues to be tough, with retailers suffering from the impact of planned public sector cuts, challenging economic conditions and taxation changes," said Jason Wakelam, leader of PwC UK's Automotive Transaction Services. "These factors are likely to have a knock-on impact on used car sales, although limited supply may favor retailers, pushing up used car prices in 2011."